Lithuanian scholar and Talmudist; died at Wilna June 26, 1872. 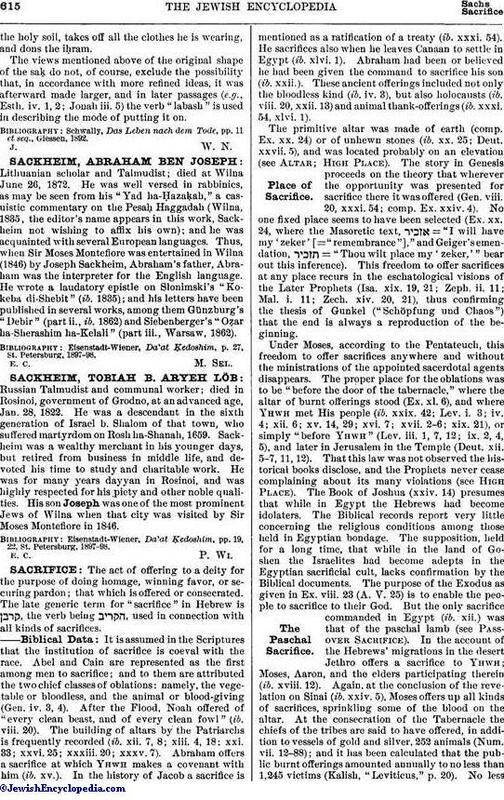 He was well versed in rabbinics, as may be seen from his "Yad ha-Ḥazaḳah," a casuistic commentary on the Pesaḥ Haggadah (Wilna, 1835; the editor's name appears in this work, Sackheim not wishing to affix his own); and he was acquainted with several European languages. Thus, when Sir Moses Montefiore was entertained in Wilna (1846) by Joseph Sackheim, Abraham's father, Abraham was the interpreter for the English language. He wrote a laudatory epistle on Slonimski's "Kokeba di-Shebit" (ib. 1835); and his letters have been published in several works, among them Günzburg's "Debir" (part ii., ib. 1862) and Siebenberger's "Oẓar ha-Sherashim ha-Kelali" (part iii., Warsaw, 1862). Eisenstadt-Wiener, Da'at Ḳedoshim, p. 27, St. Petersburg, 1897-98.